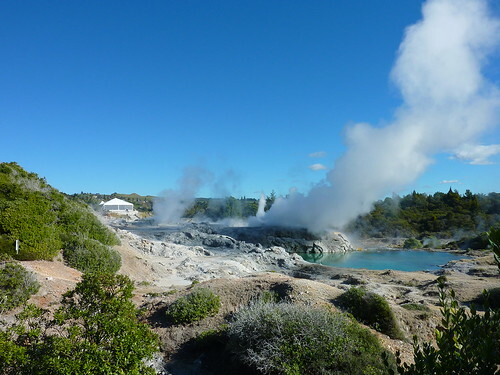 The Whakarewarewa Thermal Village is an active Maori village situated atop a volatile set of thermal springs. 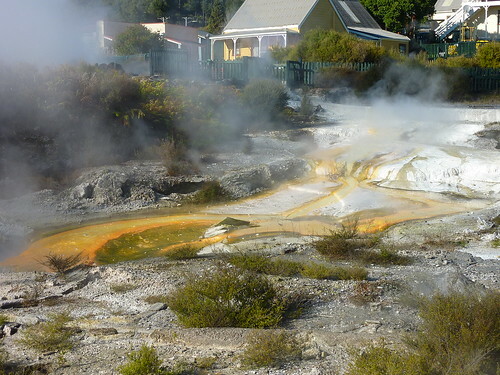 As with the rest of Rotorua, the smell of sulphur hits you once you leave the vehicle, but you soon get used to it. Entrance is through an imposing arch and over a bridge - we arrived just as a tour was starting there, so tagged along. The first thing we learned about were Penny Divers: kids up to the age of 14 who traditionally jumped from the bridge into the river to collect pennies thrown by tourists. They put them in their mouth to keep them safe once they'd collected them. The Queen came to visit the village the year after her coronation and chucked some in, which went down well with the locals although they were probably expecting rubies or doubloons or something a bit more extravagant from a monarch. These days, the kids don't really jump from the bridge, instead lowering themselves in from the bank (health and safety and all that) and the pennies have suffered from inflation and now nothing less than a gold coin ($1 or $2) will suffice. How the times have changed. Our guide Waimaria took us to a Hangi box which is a method of cooking food by storing it in a box above a thermal hole, or actually burying it underground. After a few hours, meat and veg is thoroughly cooked and you can even cook food from frozen. 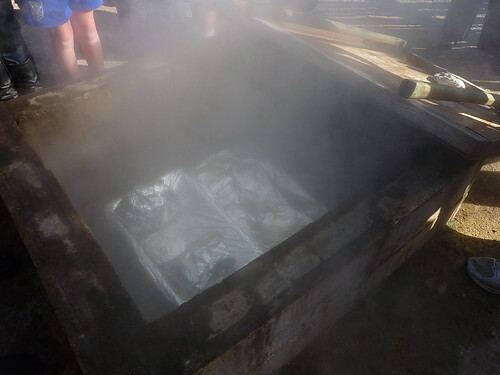 Whilst hangi meals are a traditional way of preparing food, the locals use ovens and microwaves in the village, and leave a lot of the hangi food for tourists. We were advised against it by the guy running the holiday park we stayed at, as it's fairly stodgy (meat, meat, and more meat). Other villages probably do nicer hangi meals, but then the entry fee is likely to be about 5 times the price. There are various pools and mud springs around the village, all with different names. 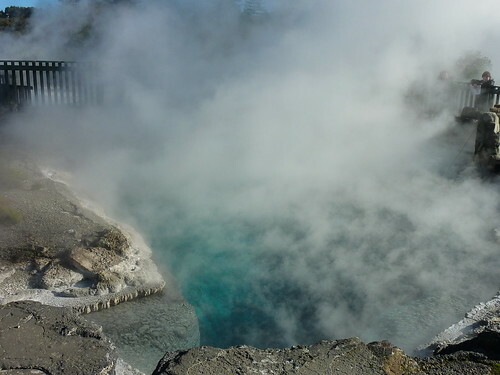 Parekohuru means "murderous ripples", but is more commonly known as the champagne pool due to its bubbling surface; it's the biggest hot spring in the village. We tried some corn on the cob cooked in the pool, and it was fantastic. 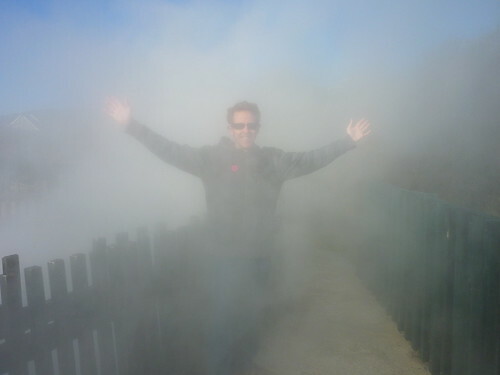 Given the lack of thermal springs in the UK, we'll definitely have to invest in a steamer when we return. The sulphur deposits cause the mud to turn into different colours around the village, more often than not a shade of yellow. Korotiotio is the most volatile spring in the village, with its name translating to "Grumpy Man". The steam given off by the spring is insane, covering the paths around it depending on the direction of the wind at any one time. 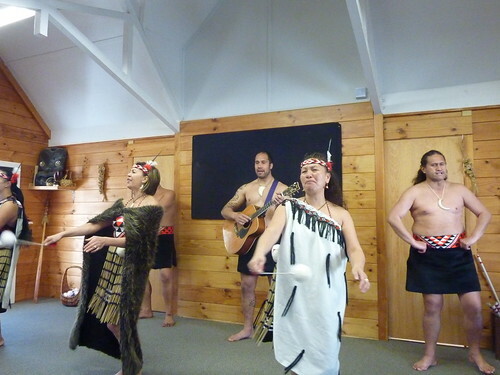 As part of the tour, we got to experience a traditional Maori performance which included various dances, some of which utilised sticks which were tossed between the participants, and others which used "poi" or flax balls attached to a length of twine which double as both musical instruments bounced off hands to keep a beat, and an almost artistic dance tool that can be whirled about. We were treated to "double poi" at the end, where the women took two poi in each hand and span the four of them about without them hitting each other or the other performers. Even more impressive was the haka performed by the men. Us Brits have probably only seen the haka at the start of a match when the All Blacks are playing, but having it done right in front of you is pretty special, bulging eyes, massive tongues and all. The people are exceptionally friendly, and more than happy to pose with you. There is a great view from the village of two geysers. The smaller of the two is called the Prince of Wales Feathers, whilst the biggest is called Pohutu and can erupt up to 40 metres in height. We didn't see it reach this peak, but it was a sight nonetheless. 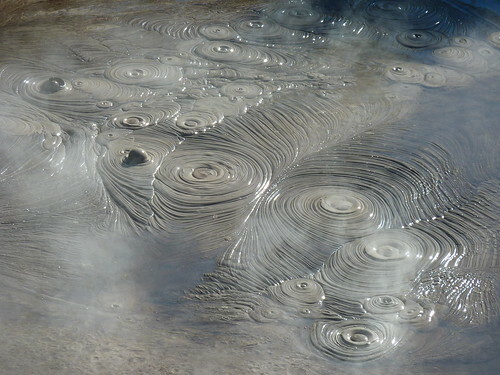 In warmer summer weather you get to see more of the actual water erupting, as the cool winter air almost immediately turns the eruption to steam. 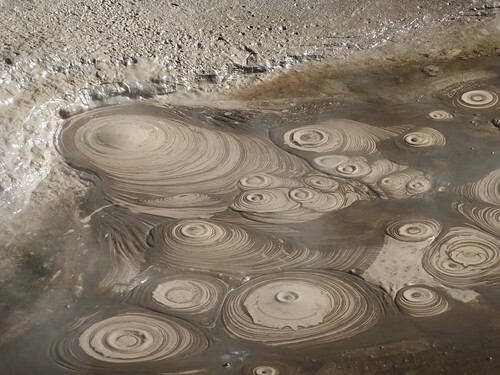 The mud pools reach temperatures between 80 and 90 degrees Celsius. Alas, we weren't allowed to take a dip. I hear that mud does great things to your skin, but at that heat it would probably just slough it off. Great for cannibals, not so great for me. The village was a decent day out, and reasonably priced. 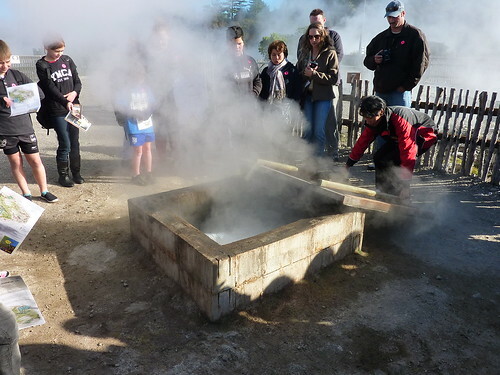 There are a lot of "cultural performance" attractions in and around Rotorua which may or may not be better than Whakarewarewa, but if you're looking to encompass the main aspects of the area (geysers, thermal springs, haka and poi performances) in one day, then this is probably the best option. We attempted to drive to the Skyline Luge in the afternoon, but we foolishly took the advice of our sat nav, which took us up a long and winding mountain path before attempting to get us down to the Skyline entrance by sending us over the edge of the cliff face and down through a forest (presumably tumbling, A-Team-style, in our van). 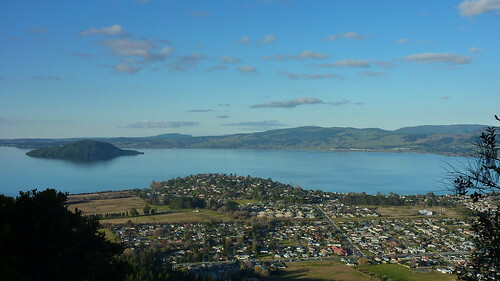 I have no idea why it thought there was a road there, but we thought better of it and drove back to the holiday park, getting some snaps of the view over Rotorua en route since we were up in the mountains. We decided to leave the Luge until the next day, and instead fed some very grateful ducks in the park in the evening. I've yet to meet a duck that wasn't starving.